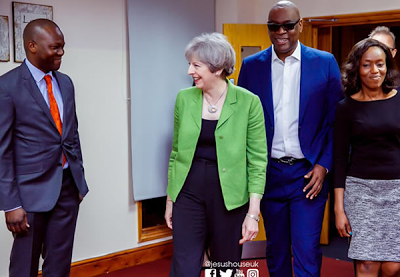 [The Church Blog] Theresa May at RCCG Jesus House, should we be concerned? Sometime, last week, Theresa May, British Prime Minister made her way to The Redeemed Christian Church of God, Jesus House, UK which is undoubtedly one of the biggest churches in the UK and that singular action gathered a lot of reactions online; both positive and negative. This is not the first time this is happening; David Cameron, before his re-election also visited the same church. Let’s come down to Nigeria. From Obasanjo to Goodluck Jonathan to Akinwunmi Ambode and several others, one should have noticed a particular trend of political visits to churches around election periods, particularly the ones that attract a crowd. This is too strategic a visit to be a mere coincidence and should be enough indication for us to think this through. Should we receive politicians in our churches? Why not! They are human beings too and have the right to and deserve the right to fellowship wherever they deem fit. One should only ponder on the nature of their visit and why they never think of the church until it’s time for elections. Sadly, we have seen a trend of special treatments, special prayers and subtle campaigns at play during these “coded visits”. Offering special recommendations to politicians, anointing them on our pulpits and giving them a chance to campaign, sorry, exhort the brethren hasn’t gotten us anywhere. By the way, who still anoints political leaders?? These politicians aren’t dumb and we should be much smarter. We should be very aware of their stratagem. They have discerned our religious bias in the area of politics and have decided to play that card to their advantage but we shouldn’t let them. Believe it or not, the church holds so much intrinsic political power and men like Leke Alder have dedicated a large chunk of their resources to help us discover this and use it effectively. The idea, therefore, is that we guard our platforms jealously and be careful of who comes to our local churches. These politicians aren’t visiting your churches just to admire the lights, the sound and our beautiful congregation. They have an agenda. It means that they know something that we are either ignorant about and honestly so or we are pretending not to know. The former can be easily cured by knowledge but the latter might need some special anointing oil from the throne of heaven. Omojuwa, a Twitter influencer once said, “no matter how hard you pray and fast, you can never pray for someone that is pretending to be asleep to wake up; you leave them to decide when to wake up”. Like the Bible rightly admonishes, watch and pray!